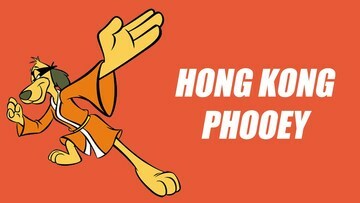 Hong Kong Phooey is a 30-minute Saturday morning animated series produced by Hanna-Barbera Productions and broadcast on ABC from September 7, 1974, to December 21, 1974. It was a parody of kung fu shows and movies of the time. The main character, Hong Kong Phooey himself, is the clownishly clumsy secret identity of Penrod "Penry" Pooch, working at a police station as a "mild-mannered" janitor under the glare of Sergeant Flint ("Sarge"). Penry disguises himself as Hong Kong Phooey by jumping into a filing cabinet despite always getting stuck — and unstuck by his striped cat Spot — and once disguised, gets equipped with the "Phooeymobile" vehicle that transforms itself into a boat, a plane, or a telephone booth depending on the circumstances by banging his gong or changes automatically whenever necessary. He fights crime relying on his copy of The Hong Kong Book of Kung Fu, a correspondence-course martial-arts instruction handbook. However, his successes are only either thanks to Spot, who provides a solution to the challenges, or the direct result of a comically unintended side effect of his conscious efforts.